Department of Anthropology, University of Pune, Pune, India. health hazardous. 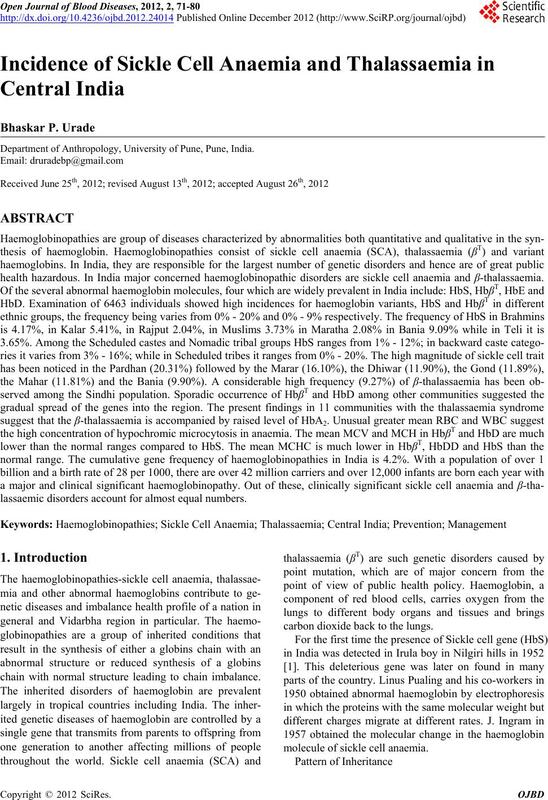 In India major concerned haemoglobinopathic disorders are sickle cell anaemia and β-thalassaemia. lassaemic disorders account for almost equal numbers. chain with normal structure leading to chain imbalance. carbon dioxide back to the lungs. molecule of sickle cell anaemia. (30 percents) and sickle cell anaemia (70 percents). gal, Bantu, Benin, Asian and Camroon across the world. standard procedure as described by Dacie and Lewis . mated by the method of Betke et al. .
ciency status by florescent spottest . Table 1. 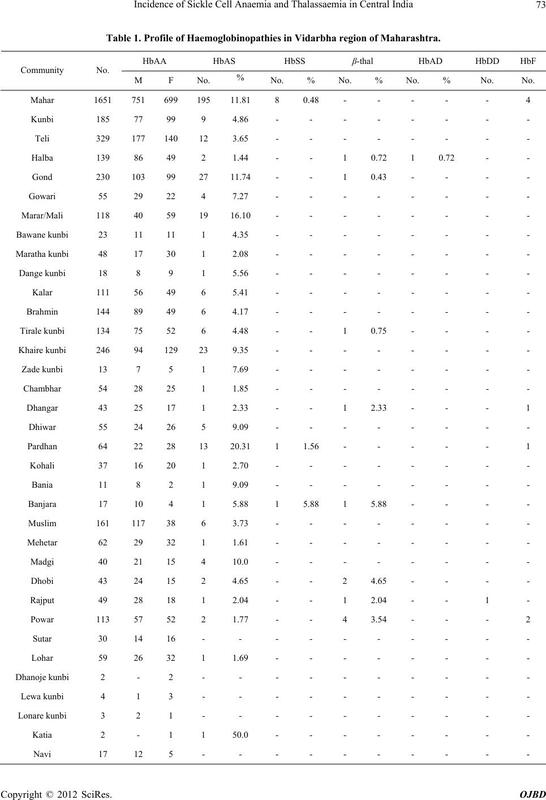 Profile of Haemoglobinopathies in Vidarbha region of Maharashtra. M F No. % No. % No. % No. % No. No. Sindhi population of Nagpur [13,23]. Figure 2. Community-w ise frequency distr i bution of SCT in Vidarbha. Figure 3. 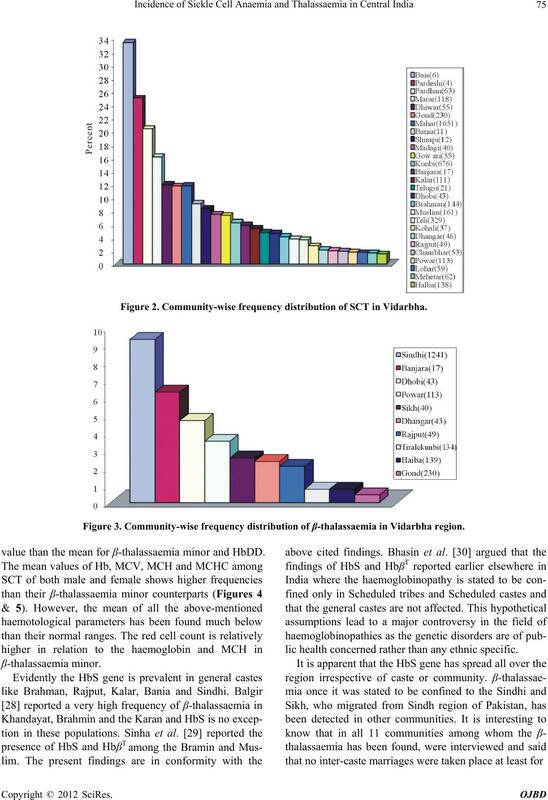 Community-wise fr eque nc y distribution of β-thalassaemia in Vidarbha region. value than the mean for β-thalassaemia minor and HbDD. lic health concerned rather than any ethnic specific. Figure 4. Distribution of mean of cell morphology. Figure 5. Distribution of mean of cell morphology. pletely absent in sickle cell anaemia. population, which ultimately reached a high frequency. protective mechanism in ameliorating the quality of life. probably related to the raised HbF level found in Indian. Sikh is in agreement with the earlier reports [21,24,43]. disorder affecting the millions of population worldwide. 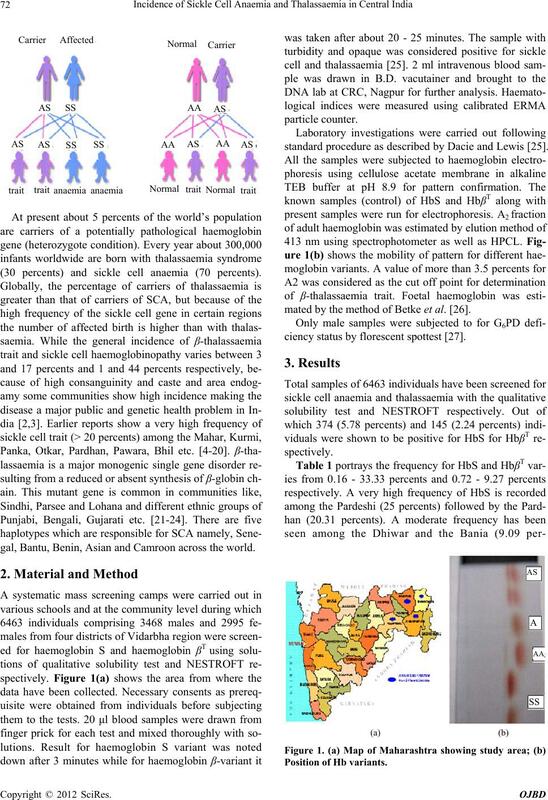 prevalence in the migrant population of Sindhi origin. the genetic material (DNA) what is called mutation. beyond the Sindh and Punjab regions to central India. screening at the community level. risk and advice for prenatal diagnosis. tural, religious and ethical views of the individual. important for planning and evaluation of intervention. India and the Challenges Ahead,” Current Science, Vol. tology and Blood Transfusion, Vol. 20, 2002, pp. 2-7. 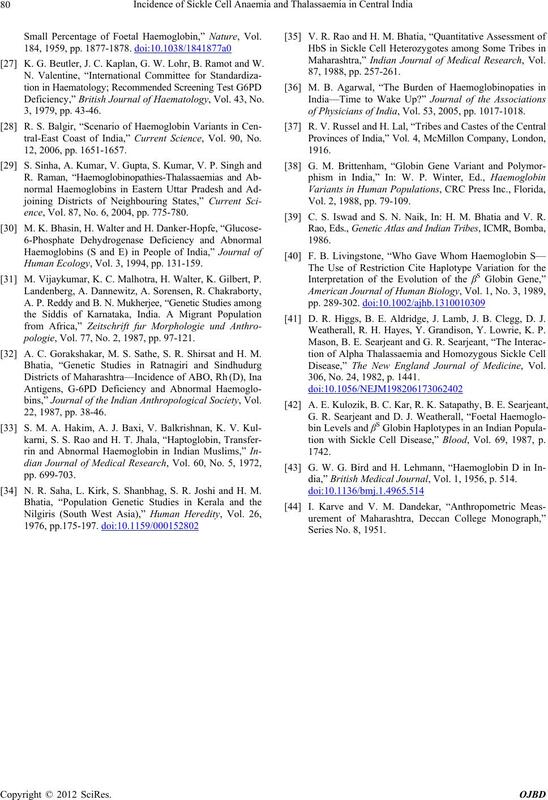 Central India,” The Lancet, Vol. 271, No. 7015, 1958, p.
Medical Research, Vol. 56, No. 6, 1968, pp. 821-825. Research, Vol. 66, No. 2, 1977, p. 260.
versity of Calcutta, Calcutta, 1976.
cal Science, Vol. 55, No. 2, 2001, pp. 99-108.
pogenetica, Vol. 5, No. 1, 1981, pp. 41-56. 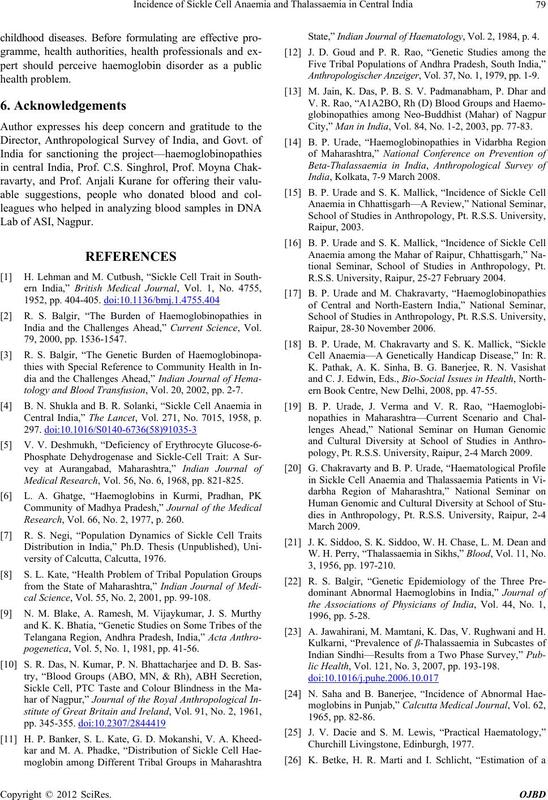 State,” Indian Journal of Haematology, Vol. 2, 1984, p. 4. Anthropologischer Anzeiger, Vol. 37, No. 1, 1979, pp. 1-9. City,” Man in India, Vol. 84, No. 1-2, 2003, pp. 77-83. India, Kolkata, 7-9 March 2008.
tional Seminar, School of Studies in Anthropology, Pt. R.S.S. University, Raipur, 25-27 February 2004. 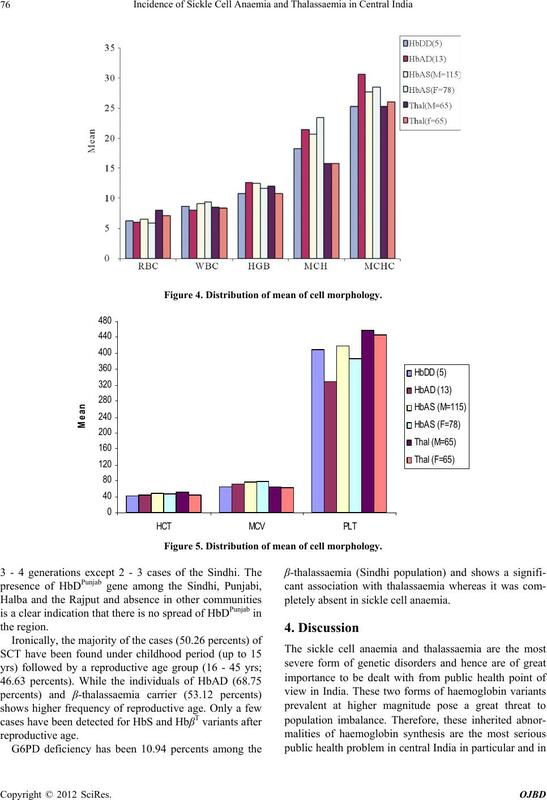 Cell Anaemia—A Genetically Handicap Disease,” In: R.
ern Book Centre, New Delhi, 2008, pp. 47-55.
pology, Pt. R.S.S. University, Raipur, 2-4 March 2009. W. H. Perry, “Thalassaemia in Sikhs,” Blood, Vol. 11, No. 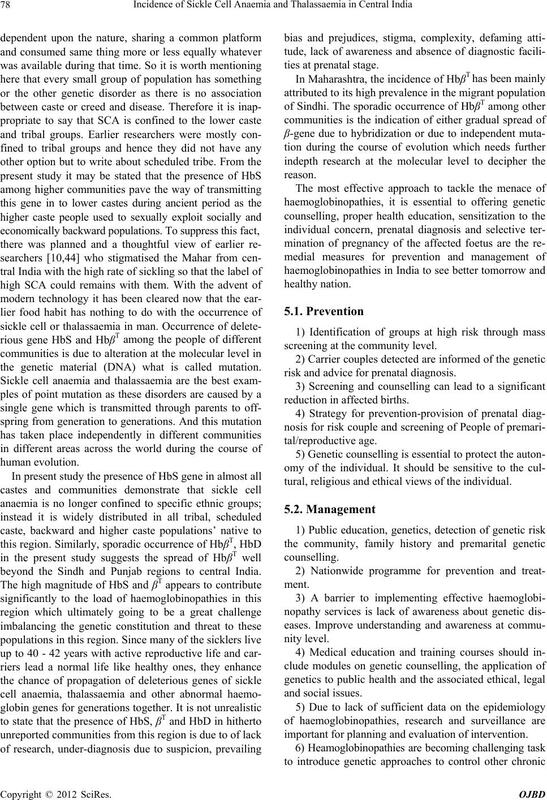 A. Jawahirani, M. Mamtani, K. Das, V. Rughwani and H.
lic Health, Vol. 121, No. 3, 2007, pp. 193-198. 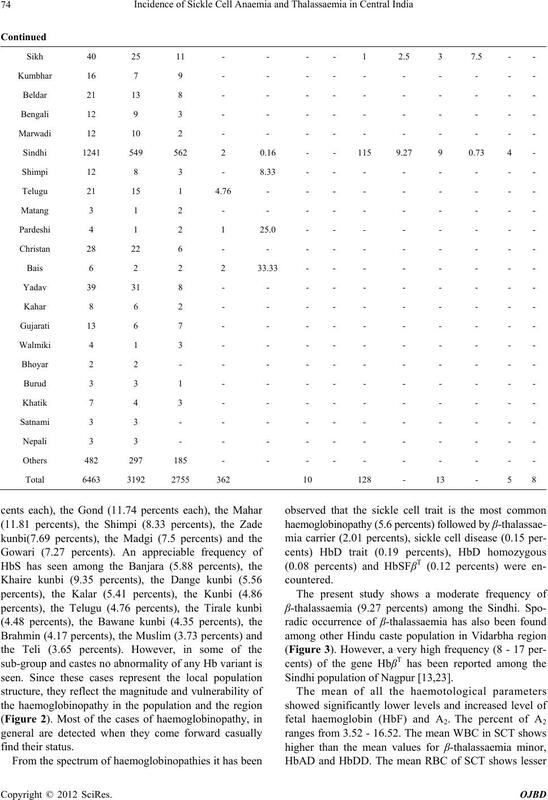 Small Percentage of Foetal Haemoglobin,” Nature, Vol. K. G. Beutler, J. C. Kaplan, G. W. Lohr, B. Ramot and W.
Deficiency,” British Journal of Haematology, Vol. 43, No. tral-East Coast of India,” Current Science, Vol. 90, No. ence, Vol. 87, No. 6, 2004, pp. 775-780. Human Ecology, Vol. 3, 1994, pp. 131-159. M. Vijaykumar, K. C. Malhotra, H. Walter, K. Gilbert, P.
pologie, Vol. 77, No. 2, 1987, pp. 97-121. A. C. Gorakshakar, M. S. Sathe, S. R. Shirsat and H. M.
bins,” Journal of the Indian Anthropological Society, Vol. N. R. Saha, L. Kirk, S. Shanbhag, S. R. Joshi and H. M.
Maharashtra,” Indian Journal of Medical Research, Vol. of Physicians of India, Vol. 53, 2005, pp. 1017-1018. Vol. 2, 1988, pp. 79-109. C. S. Iswad and S. N. Naik, In: H. M. Bhatia and V. R.
 D. R. Higgs, B. E. Aldridge, J. Lamb, J. B. Clegg, D. J.
Weatherall, R. H. Hayes, Y. Grandison, Y. Lowrie, K. P.
Disease,” The New England Journal of Medicine, Vol. 306, No. 24, 1982, p. 1441.
tion with Sickle Cell Disease,” Blood, Vol. 69, 1987, p.
dia,” British Medical Journal, Vol. 1, 1956, p. 514.